Hydrotherapy is an important part of the success of many of our rehabilitation therapy patients. The term refers to the use of water for recovery after surgery, injury, or age-related decline. At 1st Pet, hydrotherapy for dogs and cats happens in an underwater treadmill, which allows for a very controlled environment for healing. In addition to being essential for maintaining proper hydration, we take advantage of other properties of water that make it useful for promoting health and healing. Adjusting the water temperature causes changes in circulation, inflammation, and tissue metabolism. The resistance to movement in water also increases the effectiveness of some exercises. The water’s buoyancy allows us to reduce the effects of gravity, allowing for a more gradual return to activity that can begin in earlier stages of recovery than land-based exercise. Our underwater treadmill has helped many of our patients make it quickly down the road to recovery following a variety of illnesses, injuries, and post-surgical healing. Their recovery tends to be much quicker and more complete than is usually seen with typical activity-restricted, wait-and-heal protocols. We have even seen success with several patients who were previously terrified by water. Our patients enter the treadmill while it is empty. They are given lots of treats to make it an enjoyable experience. The water is warm and fills up gradually, helping the pet feel comfortable and in control. The presence of pet parent(s) nearby and the technician in the water also keeps them occupied and supported. In many cases, even pets that used to be very fearful of veterinary hospitals and care in general begin dragging their parents into the treatment area because they associate it with pain reduction and tasty treats. Help Your Pet Recover. Sooner. 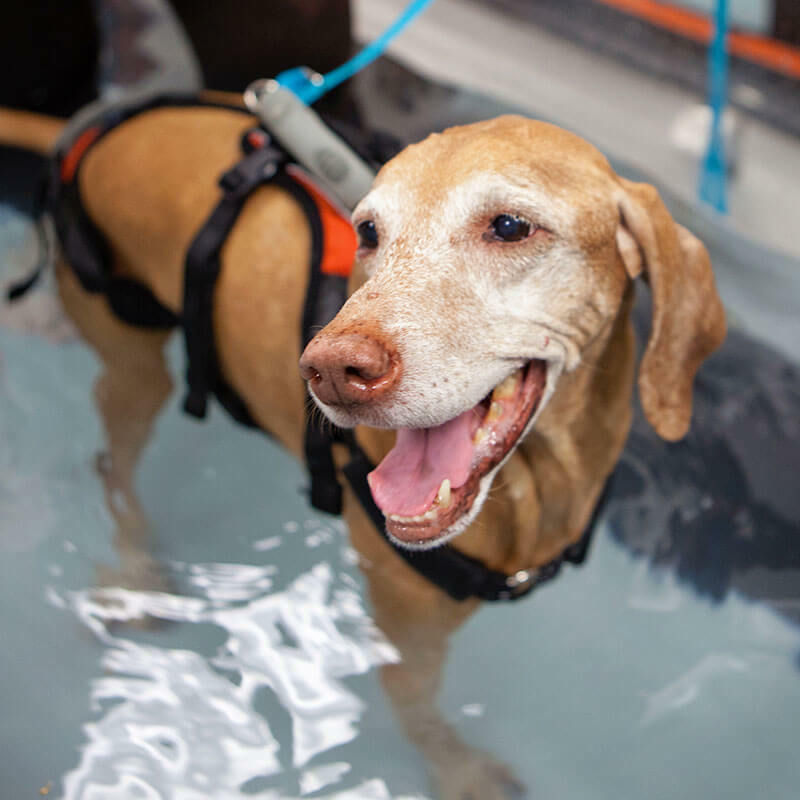 Following an evaluation by our Rehabilitation Therapist, we will set up a treatment plan that may include underwater treadmill sessions, if your pet is a good candidate. Your pet does not have to suffer through the same long, incomplete recovery that other pets experience.